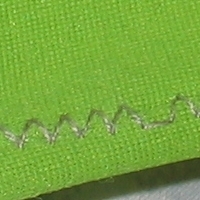 Using Bekaert Thread and sewing using a zigzag stretch stitch on stretch fabric. you will find that stretch is proportional to resistance. Using conductive stretchy fabric from LessEMF, you can get some small resistance changes with stretch. This might be ideal for large curtain installations. 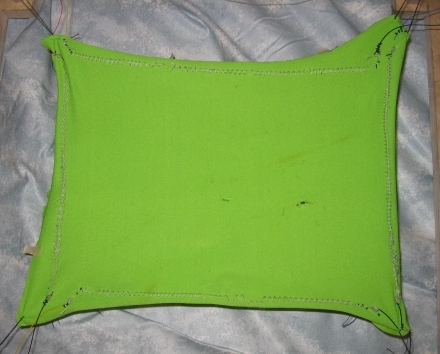 A few test stictches on Bekaert fabric were made to determine the resistivity with regards to stitch type and change in length of stretch was determined. My Brother LS-2125sewing machine had 10 types of stitches, so I tried them all. The thread would break every so often, due to the thread on the reel having variable tension on it, and being quite thick. I sewed with the thread on the spool, instead of the bobbin because I found that it jammed less (although the thread broke). I also switched to a thinner needle for lightweight fabrics, rather than the standard size #40 needle. Resistivity increased with amount of thread, so close stitches resulted in higher resistivity, but less change in resistance when stretched. 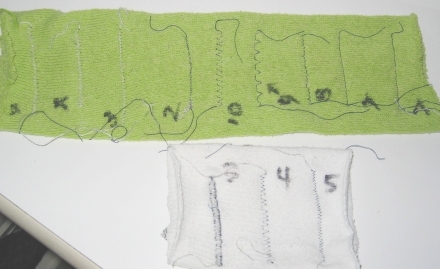 Stitches that had more contact points were less likely to rip out when the fabric was stretched beyond a few inches. 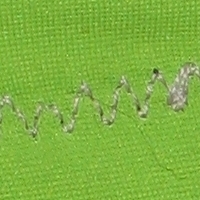 Although a "stretch stitch" , which had 3 points of contact along each zig zag, was prefered for minimal threads coming out of the fabric, it did not give the best dynamic range. However, I also favored the #4 wide zigzag stitch, which seemed to have the greatest dynamic range. 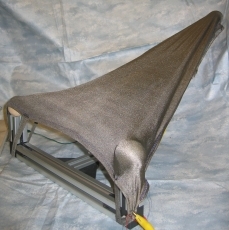 The fabric controller was designed to support how people interacts with fabrics. We pull on hems, push shirts under other clothes, and might even scrunch them up to toss a piece of fabric into the hamper. I built a portable frame that would support these interactions. 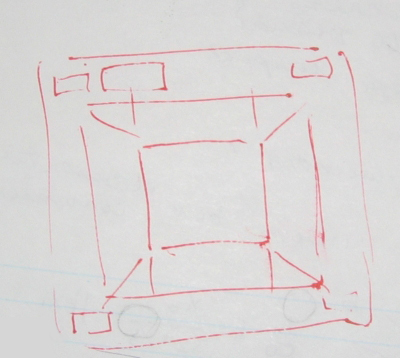 At first, I had planed for a stand-up interaction, thinking about curtains that hang or stand-up displays. Upon realizing the integration of different capabilities (moving from sewing area to electronics bench to testing area, I realized the need to start with something portable for ease of testing). So I made a tabletop frame that allows the fabric to be tensioned between the four corners. The fabric stands off the tabletop at 2.5", with leads at each of the four corners. The main consideration was unimpeded access to the fabric. 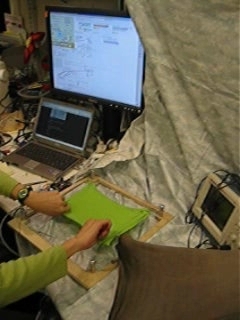 Another consideration is that the feel and access of the fabric should be unimpeded by the electronics. The resistance of each side measured approximately 10MOhms at rest, and increased when stretched. I made a voltage divider so that the change in resistance would be transduced into voltage. I built a follower circuit to sense the change in voltage for each leg. Here is one circuit diagram, representative of each leg. The fabric was the lower leg of a 1:10 voltage divider. The change in voltage was typicallly between 4.7V-3V. 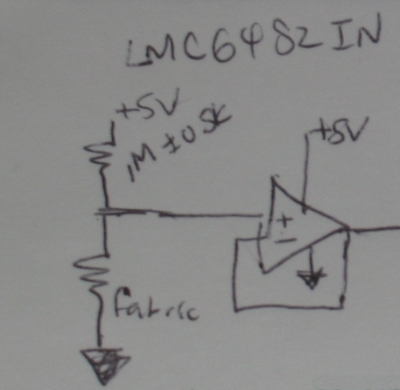 Due to the closeness of the input voltage to the rails,Matt Malinowski helped me find the right op-amp for the job, an LMC6482 which had a high common-mode range. 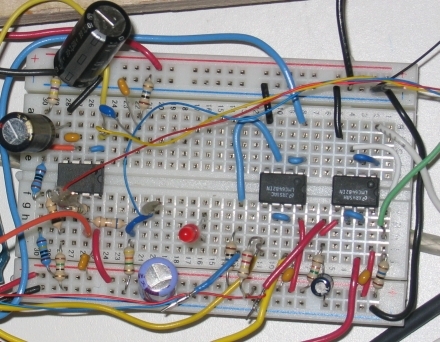 here is the circuit breadboard. The four strain readings are being taken on the righ side of the board. The circuit on the left side is for the conductive fabric part of the project, which I will explain later. Unfortunately, the conductive fabric triangle didn't work very well and had many noise problems. II am a novice to PD, but I had an initial notion that stretching the fabric sideways might map to reverb, or speed of some musical piece. Meanwhile, stretching the fabric vertically should map to volume. I found a patch that allowed me to load a music snippet and alter the speed and volume. For the other side, I had pitch of an "interrupting" zing noise mapped to the top, and the volume of that interrupting noise was on the right. Click below to open up a bigger window of the patch. *thanks to Ian for re-encoding the WMV into a more manageable size. I will have an osciloscope output and closeups coming soon, as soon as I can find a tripod. in general, the strain sensors were very responsive. 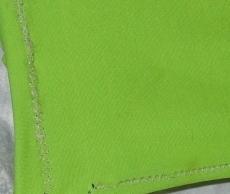 Stitches:Some stitches came out with increased use. The fix for this was to patch with new conductive thread. However, in the future, I'll stick to the "stretch stitch", because the other stitches seemed to lose some sensitivity over time. Fabric too stretchy. One reason why you had to stretch directly onto the thread strain gauges was because if you stretched elsewhere, then the stretch never transmitted to the part with the strain gauge. I will look for slightly less stretchy fabric next time, so that the stretch is adequately transmitted across the fibers. 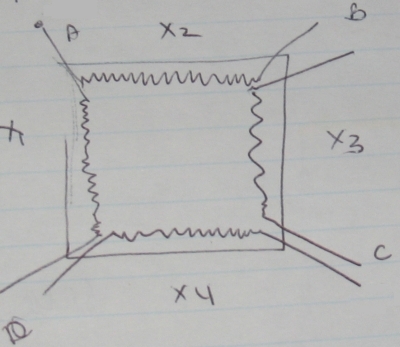 Another suggestion JoeP had was to make patterns with the strain gauges covering more surface area. I also tried to make a controller out of onlyconductive fabric. The main problem was that the resistance of the fabric was on the order of 5 ohms between points where I was measuring resistance, and the resistance was changing about 1 ohm between no stretch and about 4" inches of stretch. At that rate, I was burning out resistors and also had a problem with the noise threshold. 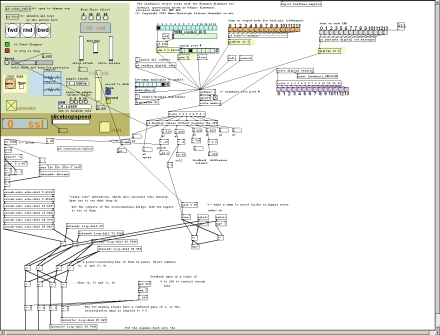 Mappings, there's still a lot of work to be done with mappings. However, it seems the sideways pitch and speed controls were okay, and the up/down motion mapped nicely to volume control. I think I needed to play more with PD to make nicer sounds with the pitch. In general, i was very pleased that the controller supported some twisting, pulling and pushing. 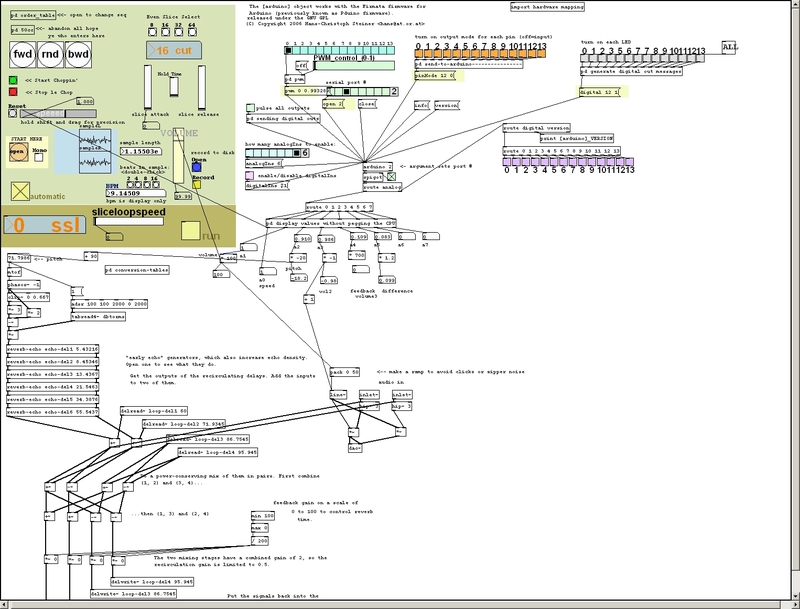 If I work on the mappings, I think it could be a very compellling performance instrument. AUTEX Res. J., vol. 3, no. 4, Dec. 2003.
no. 3/4, pp. 840–860, 2000. R. Wijesiriwardana, T. Dias, S. Mukhopadhyay, and K. Mitcham, “Knitted strain gauges,” presented at the SPIE Microelectronic for the New Millennium Maspalmas, Gran Canaria, Canary Islands, Spain, May 19, 2003, P5116-31. I'd like to thank Joe Paradiso, Dave Merrill, Matt Malinowski, and Jim Gouldstone for their help in all aspects of this project. Without them I would have taken 10X as long to figure out how to implement this. All your advice was correct, i should have listened earlier.